These funky Voodoo doll key chains are one of the cheapest you can buy considering some of them can sell up to £4.00 each and we sell them for less then a pound each. 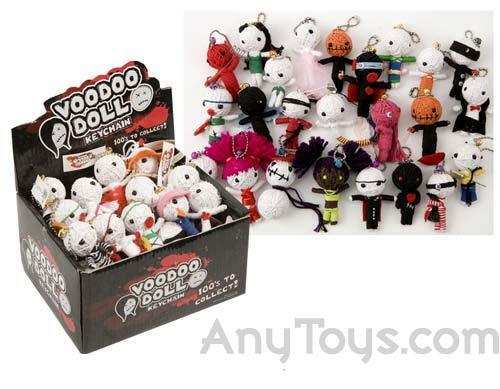 Voodoo doll key rings are great to hang from your mobile phones, bag, Nintendo DS and Mp3 players etc, etc. Voodoo doll key chains are available in more than 100 different designs to collect and are made of primarily cotton string and metal. Please note, this item is not a toy and not suitable for small children due small parts and sharp points. All our items are send out at random and we have no way of telling what model you might get or whether you will have repeats of each model. You will receive 6 random models when you place an order for this item.